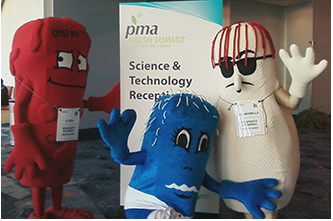 Visitors to the Produce Marketing Association Fresh Summit trade show Oct. 17-19 in Anaheim, Calif., had to go out of their way to avoid a trio of “nasty characters” representing foodborne bacteria. The costumed characters, Sal Monella, E. Coli and Liz Teria, evolved from original illustrations TCA first developed for our client Birko’s produce brochure and in advertising. Later, we worked with a theater costume designer on costumes for the trio. Professional character actors wore the costumes during the PMA show, helping draw visitors to Birko’s booth. The characters were immensely popular and obliged many show-goers’ requests for photos. Sal, E. and Liz are notorious for causing chaos in food processing plants but Birko’s chemistry and equipment can successfully fight off this infamous gang.